Join Certified Westalee Sewing Expert Kothy Hafersat as we explore all the things you can do using a ruler foot and templates on your regular sewing machine. This class is NOT difficult, and beginners are welcome along with those having some template experience. Kothy will offer tips and tricks to help you get the very best result. 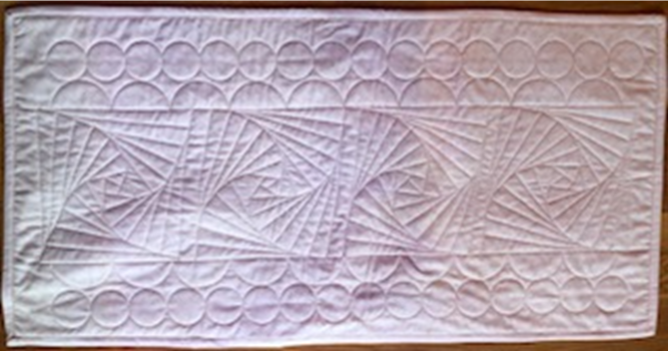 The morning session will be learning and practicing with the 12” arc ruler and the 2” circle ruler on an 18” square quilt sandwich. The afternoon will be the “real thing” as you make a 42” x 18” quilted runner. The fabrics and batting, along with lunch, is all provided in the class fee of $75. Separate supply list provided upon registration.